The Syrian refugee crisis needs a structural policy. Europeans have had excellent ideas like AirBnB for refugees in Germany and people offering their homes in Iceland. But about 4 million Syrian refugees have left Syria and more than 6.5 million have had to move inside Syria. The problem needs structural policies from governments. Asylum is a human right, not an act of charity. European Union (EU) governments should make sure this human right is not lost because of austerity, nationalism, and xenophobia. On 3 September 2015 British Prime Minister David Cameron suggested that the solution is to bring ‘peace and stability to that part of the world’. Long-term solutions must look at the real causes (i.e. the Syrian civil war), but Cameron and other EU leaders must take responsibility for refugees arriving on their own borders. A swimmer at a pool would not let a person drown and say that we must look at the ‘real cause’ first and that the person should learn to swim. To look at these problems EU leaders have planned an emergency meeting for 14 September to find a European answer to the problem. This is most likely to include quotas - numbers for each country to take up to 100,000 refugees across the EU to share the numbers outside of Italy, Greece and Hungary. 100.00 is of course a small number. Governments working together will share the numbers of new refugees throughout the EU. Richer countries – including those outside of the EU – can take more refugees than poorer countries. Germany is leading the way and is planning to accept 800,000 Syrians. But Britain, France, the US, and others need to offer much more help. There are problems with agreeing a unified asylum system. European diplomats have been negotiating the Common European Asylum System since 1999, with little progress. One of the main challenges is that the Dublin Regulation says asylum-seekers must be processed in the first European country they enter. With the problem now, this seems impractical and needs rethinking. 1 Immediate humanitarian aid to refugees travelling in the EU or near its borders European governments should work together to give humanitarian aid. Refugees near a border or who have just crossed a border into the EU need food, medicine, shelter, and clothes. The question of who will give asylum is still a problem but giving food to hungry children and families should not be a problem. A central European or UN agency should lead this work. 2 Finance for the UN High Commissioner for Refugees emergency budget If governments are serious about helping the refugee problem, the quickest route is to fully finance the agency which can help best – this is the UN High Commissioner for Refugees (UNHCR). The UNHCR protects refugees and helps with refugee problems worldwide. When governments do not pay, the UN has to cut food rations for refugees. The World Food Programme reported that in May 2015 more than half of the Syrian refugees in Lebanon did not have enough food. 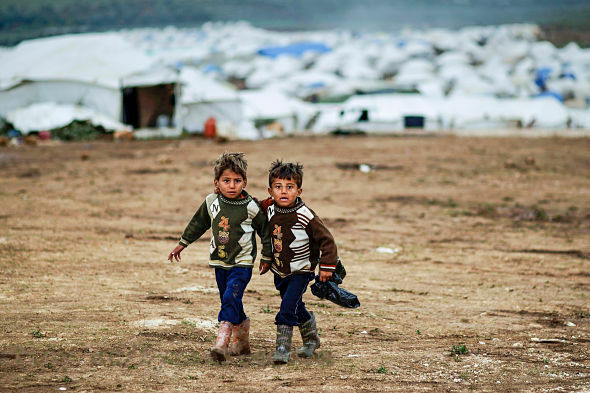 This year the UNHCR said helping Syrian refugees in 2015 would cost more than $4.5 billion. Governments have given $1.7 billion (only 37%) to the UNHCR. The EU and other governments can and should give more to the UNHCR emergency budget. 3 Immediate refugee status for all Syrians in the EU Earlier this year, the European Commission published the European Agenda on Migration with the hope of starting EU-wide policies. One idea is to make a list of ‘safe countries of origin’ to make asylum applications faster because all member countries would use the same system. For this to work, border officials must respect individuals’ stories and not only the situation in their country of origin. UNHCR understands that in times of emergency it is impossible to interview every person. The practical way is to give immediate refugee status. In 2006, Sweden recognized that this was necessary to protect the large numbers of displaced Iraqis. For Syrians this could make the process faster and the same for all EU countries. 4 Overseas asylum-processing centres Some European diplomats have talked about opening processing centres overseas to allow refugees to apply for asylum without making the dangerous journey by land or sea. This could be done through EU country embassies around the Middle East or North Africa. After asylum is given, the EU would give them safe transport to the continent and this would be part of the sharing system. But this is a problem in two ways. First, the UK is against it. Second, refugee advocates worry that it will make it more difficult for asylum-seekers who do not apply abroad. But if legal routes can be made easier, they should be. If we can save lives by processing applications abroad, we should. 5 Make the Mediterranean safe European countries have a moral responsibility to have safe borders. This summer has shown that the Mediterranean is one of the most dangerous borders in the world. In 2014, the EU drastically cut the search-and-rescue mission Mare Nostrum, which we think saved more than 130,000 lives. The EU replaced it with Triton, a much smaller security mission. The EU increased its budget after criticism but it is still not enough. A good search-and-rescue mission would find and help all boats in danger. If boats are in danger and are not rescued – as has happened – the agency and leadership should be held responsible. Someone must be held responsible for the growing numbers of deaths in the Mediterranean. The EU should create an agency responsible for rescuing boats. 6 More resettlement to the US and Canada The UNHCR has a good resettlement programme. It is organising the resettlement of over 70,000 Syrian refugees. This is a large number but we can do more– especially in the United States. The US has a good record for resettling refugees and should make a new special visa route for Syrians, as it was done before for Iraqis. 7 Have a Special Representative for Human Rights in Migration The EU should find a new official to report on human rights in asylum, detention, and deportation. The job should research and record human rights violations in migration. It should also have ideas to help countries looking for the best way to organise migration. The UN special representative for migration, Peter Sutherland, should do all of this. But an EU official will be in a better place to hold member states responsible for human rights violations on their borders and in their own detention centres. This special representative should make sure that rights of asylum are not lost. Overseas applications centres would make seeking asylum safer. But there will still be people who make the dangerous journey to apply within the EU. These applications must be judged fairly. It is not criminal. It is not cheating the system. As EU leaders meet later this month, they will talk mainly about quotas and numbers. But they should not forget all the other policies that would help the refugee problem in Europe. NOW READ THE ORIGINAL:http://newint.org/features/web-exclusive/2015/09/11/proposals-for-eu-emergency-meeting-on-syrian-refugee-crisis/ (This article has been simplified so the words, text structure and quotes may have been changed). This page was last edited on 11 September 2015, at 18:39.